Questions, Comments, Suggestions? Email me! Special thanks to all those who've helped make it better: Big Bear, BioMotor_Unitron, BonusKun, Briggs, Chris1, RyoGyo, Shawn, Tiptonium, et al. Common short hand for the Neo Geo Advanced Entertainment System. Originally created in 1990 by SNK. It began as a rental-only, arcade-exact system (see AES) in Japan before its huge popularity prompted SNK to release it for purchase. From its inception, SNK planned an arcade version (See MVS) to promote the home system in arcades. Much to the surprise of SNK, the arcade version was a historic success while the AES version fizzled into a cult following. The system (home and arcade) is the longest supported system (by a parent company) in video game history, surpassing the Game Boy/Game Boy Color. It is why this site and this community exists. Also referred to as the "Neo." Term describing cartridges for the Neo Geo home system (also known as home carts). Stands for Advanced Entertainment System. The term originally described the system itself: the English language logo for the Neo Geo had “Advanced Entertainment System” stamped between the Neo and Geo -fulfilling the Japanese love for adding superlatives to their product descriptions. The term has now become a popular short hand for describing a Home Cartridge (i.e. “I traded my Robo Army CD for his Metal Slug 3 AES.”). AES carts are not compatible with the arcade (MVS) system (except by conversion). Alternatively described as "NGH" games. Term describing cartridges for the Neo Geo arcade system. Stands for Multi Video System. The term is actually part of the name of the arcade system: the Neo Geo Multi Video System (See Neo Geo MVS). Although they contain the same “guts” (ROM chips and such), they are not compatible with the home system (different size outputs). They manufacturer did this to prevent arcade operators from buying the then cheaper home carts (MVS carts debut in the $500-$1200+ range, home carts in the $180-$300 range). Company that created the Neo Geo. Stands for Shin Nihon Kikaku (New Japan Project). Operated from 1978-2001. Began creating arcade games in the late ‘70s, created a number of popular series (like Ikari Warriors) in the early ‘80s and ported many of them onto computers and the venerable NES. In 1989, SNK entered the home system market with the Neo Geo, the first ‘premium’ home system. Hit with a series of growing financial problems starting in the late ‘90s, SNK finally closed on Oct. 22, 2001. Gamers everywhere mourned. Fortunately, SNK's intellectual property rights (and more importantly its spirit) were carried on by Playmore Corp. starting in late 2001. In 2003, Playmore officially changed its name to SNK-Playmore (SNK-P). See Playmore and SNK-P. The number of games allowed on a Neo Geo MVS arcade unit. Since the games game in separate cartridges to lower costs (and promote the home system), MVS boards were designed with slots for the cartridges. More 4-slot cabinets were produced than any other. 6-slots are very large boards, and sometimes cannot fit in all cabinets. 6-slots have been known to have reliability issues, but this can be averted through proper care. Alpha Denshi Corp. Development team within SNK. Created several notable games, including the World Heroes series. Previously known as "Alpha" and Alpha Team. Advanced Entertainment Game. This is stamped on some internal boards. Term very rarely used. Amusement machine company based in New York that officially distributed SNK arcade MVS and photo-machine systems after SNK USA closed. Ceased its operations on behalf of SNK once SNK Japan closed. After Playmore bought SNK's intellectual property rights, it opened SNK Neo Geo USA to handle US distribution. See Playmore and SNK Neo Geo USA. Independent game store that specializes in converting MVS carts into home carts and doing small home releases of games that were “MVS-only.” Has a forum. Aruze Corp. is Japanese corporation specializing in pachinko games (Japanese gambling machines played on a vertical pinball machine) and other gambling ventures. In an attempt to broaden its holdings, Aruze bought the financially strapped SNK in its final years and put it under its Aruze Group. Other than releasing gambling simulators for the NGPC and MVS, it did very little to help SNK -leaving it out in the cold when it went bankrupt in 2001. After the bankruptcy it no longer possessed the SNK intellectual copyrights. Aruze tried to hold onto the SNK name within the Japanese market, but upon Playmore's (the successor to SNK) move to Japan, Playmore was able to win title back the the SNK name. The clear plastic bag that contains the instruction booklet in new Neo Geo home cartridges. These are considered a component of a “complete” cartridge and are valued by some collectors. The family that managed SNK USA in its final years, headquartered in San Jose, CA. Following the Japanese business tradition of trusting families to run a business, SNK Japan hired the Barone family to control SNK USA. This proved another disaster for SNK Japan. Under their misguided leadership, the Barone family ignored the niche US home cart market, completely botched the launch of the Neo Geo Pocket Color, and did nothing to further arcade sales of the MVS or SNK Photo Systems (which were both awarded to Apple Photo Systems after SNK USA's demise). SNK USA was closed in 2000. The Barone family will forever hold a place of infamy in the history of the Neo Geo. Something that has been made without the permission of the original copyright owner. Since these items are created illegally for quick profit, they are almost always inferior in some way to the originals. Buyer beware. To reemphasize, these are illegal and grounds for legal action. Playmore (the current holder of all SNK copyrights) has demonstrated its willingness to take to court anyone who violates its copyrights with bootlegs. See Counterfeits. Former corporation based in Osaka. Strong corporate roots originating from SNK. Developed the Crystal System (See Crystal System). It was a division of Playmore until Playmore dissolved it when it moved to Japan. See Playmore. Other than their apparent spelling problem, this North Carolina based video game retailer sells Neo Geo games, but is known for lousy customer service. Term for the smaller, more space efficient Japanese arcade cabinets popular in arcades throughout the Pacific Rim. They are usually undedicated (not produced for a specific game), although many MVS candy cabs are specially adapted for the MVS marquee. See Converted Cab and Dedicated Cab. The original Japanese release home cartridges came in paper boxes (similar to the paper used in NES boxes, only much larger). The box contained a molded plastic tray that held the cartridge and manual. These home cartridge cases were thin and had a clear cover for placement of the insert. They were the size of large books and closed snugly in a clam-shell manner. Inside they contained a molded plastic tray to hold the cartridge and manual. They were replaced by new-style snap-cases in 1995. A game that was only released in the Neo Geo CD home format. These were created as incentive for buying the Neo Geo CD. The Neo Geo CDZ is the second CD system made by SNK. It has been falsely claimed that it has a double speed drive. Actually, it has a larger cache for holding loaded information, and has a more efficient CD drive. Still does not eliminate the notorious CD load times on later titles. Has been said to be less reliable than the original CD system. Coin-Operated. Refers to an arcade machine. The Neo Geo MVS is a coin-op. The scale by which the wear-and-tear (damage) to a cart is assessed. Helps buyers and sellers understand the condition of a product. These can vary from person to person, but should be understood by parties before a transaction. Here is an example of a condition scale. Original pack-in joystick by SNK. Could also be bought separately. Large rectangular base, black, and surprisingly light for how sturdy they are. The most popular Neo Geo controller. The procedure that takes an MVS cart and converts it into an AES cart playable on the home system. This involves the use of a sacrificial cartridge (sac cart) as a host for the new converted cart. The chips in the sac cart are removed (if done properly, (1) the sac cart can be restored or (2) the sac chips can be transferred to the MVS cart). Controversial method: Converting a cartridge for personal use is probably legal, selling a converted cartridge is probably illegal. Beware. An arcade cabinet that was originally designed for one game, but now houses another. Their aesthetic quality depends on the skills of the person converting the cabinet and can vary greatly. See Candy Cab and Dedicated Cab. A game that has been created by conversion of an MVS cart. Legally touchy subject. See Conversion. Cosmic Amusement Machine Company. Cheap seller of MVS games out of Hong Kong. Many of their games are bootlegs. Great prices, stellar service, very reliable. Games (either home or arcade) that are changed or copied without permission and then sold again. These are illegal and grounds for legal action. They are also less desirable than originals on the collectors market and can sometimes have inferior technical aspects that may affect gameplay. Control Panel Overlay. The decorated overlay that goes over/around the joysticks and buttons of an arcade machine. Common reference among arcade dealers and enthusiasts. A new, separate JAMMA compatible arcade board by BrezzaSoft that uses cartridges like the Neo Geo MVS. Capcom vs. SNK (also: CvS Pro, CvS2). This was the version made by Capcom. The SNK version of this match-up begins with SNK (vs. Capcom). An arcade cabinet specially designed to house a specific game, almost always by the game's distributor (Candy cabs hold some exceptions). See Candy Cab and Converted Cab. Modification that allows the Neo Geo home system to open up the debug/BIOS menu that arcade operators use (since the MVS and AES carts are the same program). Requires the installation of a special add-on chip to change the regular AES BIOS chip into the arcade chip. Neo-Geo DHP Mailing List: The original Neo Geo mailing list is still going after 9 years. Piecemeal archives can be accessed on the main DHP website (the pre-1997 archives are very incomplete). Great way to look into the past. Has been nicknamed the Neo Geo Holy Scrolls by some. Instructions on how to subscribe can be found in the Link's section of this site. 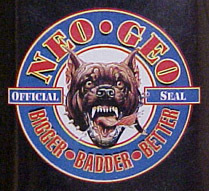 A special Neo-Geo “Seal of Quality” that was added to the spine of early US Neo Geo carts by SNK USA (seals of quality were a popular trend started with the NES). The logo’s prominent feature was a rabid dog (taken from a magazine commercial), hence the term dog-tag. This was later replaced by the standard “Neo-Geo” symbol with “Advanced Entertainment System” written in the middle. Early European carts never used the Dog-Tag and instead used the AES symbol. See Euro-Tag. To view a Dog-Tag, click here. Unlisted Yahoo Club that grew to be the largest Neo-related site on Yahoo and the center of the Neo Geo community from 1999-2000. Its single-thread format became cumbersome with so many members and it transitioned into the Forums at Neo-Geo.com. The Domain still exists and there are a number of interesting posts to be discovered by the person with the time and patience to dig through nearly 14000 messages. It was also tied to a photo gallery club. Korean software developer involved with the design of the King of Fighters 2001 and other Neo Geo games. Once thought to be the heir to SNK, is actually a developer. A program designed to simulate a home video game console on the computer. Illegal to use on commercial games, even if you own the original game. See Nintendo's excellent FAQ on the subject. See ROM (2). A memory chip whose contents can be erased by a mechanism using ultraviolet light and reprogrammed for other purposes. Bootleg MVS carts contain EPROMs that have been copied from the original ROMs of another game. These copies are known for frequent technical problems (from the transfer process) and potential failure. Also known as a PROM. Stands for Programmable Read-Only Memory. See Bootleg. While the early US versions of Home Carts used a special “dog-tag,” the rest of early English carts (collectively known as Euro-carts) were stamped with the standard Neo-Geo/AES symbol that became the standard outside-Japan Neo-Geo symbol. Developer of Neo Geo games. Based in Mexico. First game for Neo Geo was Rage of the Dragons. Also develops for the Crystal Hardware. Self proclaimed “largest video game store in the universe.” This may well be true. Warehouse-size store is located in North Hollywood, CA. Deals with all home and portable Neo Geo formats. Has been known to get good games from time to time. Also buys used games. Uses notorious void stickers. See void stickers. When SNK released the Neo Geo Gold System it included the AES system, 2 old-style controllers, a memory card, and a pack-in game. Originally the purchaser had the choice of Baseball Stars Pro or NAM-1975 (the first two games released). By the time it was wide released in the US, it came with Magician Lord as the pack-in game. Many Gold System boxes have a gold sticker stating "Includes Magician Lord" placed over the original choices. Great Western Trading Co. is a large arcade dealer that sells its own version of a Super Gun, the HGA (Home Game Arcade system). Also sells MVS carts. See Super Gun. Games and accessories that have been created by private individuals/fans. See Neo Geo Hotel Unit. See Neo Geo Hyper 64. Each game for the Neo Geo has an individual insert printed with the front cover graphics, the spine, and the back cover description. They are printed on large pieces of high quality paper that are then placed inside the clear plastic cover of both new and old style cases. Beware of forgeries, it is very hard to match the exact paper grade/quality. For a primer, check here. The international standard connection used for arcade boards (PCBs) since 1986. Created to make changing games and converting cabinets easier for arcade operators. JAMMA stands for Japanese Amusement Machine Manufacturers Association. The Neo Geo MVS is JAMMA compatible. While some think Test rigs are the same as Super Guns, Briggs notes the differences: "A Super Gun has an RGB converter so you can output a PCB to a TV screen. A JAMMA Test Rig has an isolation transformer so you can output to an arcade monitor. Other than that, they are pretty much the same, although a Super Gun is usually a lot more polished." Officially produced English cartridges that were produced in Korea. Several of the early Neo Geo AES releases featured a socket on top of the home cartridge that allowed two home systems with the same cartridge to be linked together for up to 4-player action. For a long time there was a belief that no such cables were made, however a number were created in included beneath the trays of at least some link-up games (Riding Hero is the confirmed game, see picture). The three games were League Bowling, Riding Hero, and Thrash Rally. For an extended discussion about the Link-Up Feature, please see THIS thread. SNK made controller specifically designed for mahjong games (Mahjong is a game of Chinese origin for four resembling rummy and played with tiles). Since all Neo Geo mahjong games play in Japanese-only, the controller was never released outside the country. They were not produced in large numbers and are consequently hard to find. They cannot be used for any other game as the control scheme is completely game-specific. Unlike other arcade marquees, MVS games come with special semi-transparent cards that display the game title (and sometimes basic instructions) on the lighted MVS marquee. These are sometimes called mini-marquees to prevent confusion with the few large scale marquees that SNK created for some of their larger hits. Sometimes photocopied with very mixed results. Big, solid arcade-quality joysticks made by MAS systems. They can come in one or two player units (two player units are the same size and dimension as an arcade console. Very popular among arcade enthusiasts. Multi Arcade Systems. US-based arcade company. Creates MAS joysticks, Supernovas, and does conversions. Mega Enterprise Co: Korean software developer, developed Metal Slug 4. Self explanatory. 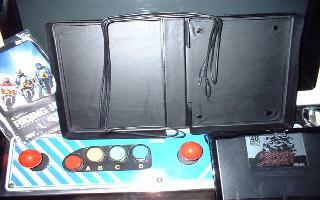 The Neo Geo was the first major home system to offer this feature, which also allowed players to save games at the arcade (fully interchangeable with both formats). The Neo Geo memory card holds 2kb of info. There is a Panasonic card that is also compatible with the Neo Geo that holds 1MB (more than you’ll ever need). They are PCMCIA cards. A modded system is a home console that has been modified with added and/or enhanced features like added S-Video, Debug chip, etc. See separate entries for different modifications. Garou: Mark of the Wolves (latest sequel of FF series, FF was called Garou Densetsu in JPN). Specially created red cases that were produced to hold MVS cartridges. These clam-shell style cases include a clear cover to hold marquees or homebrew inserts. See Shock Box. A game that was never released on the home market on either AES cartridge or CD. The reasons for their non-release range from poor game quality to perceived lack of interest. National Console Support. Import specialists operating out of New York, US. Very reputable company. NeoAlec's Unofficial Neo Geo Page was a center of the Neo Geo community until 1998. Formerly at NeoAlec.com, the site is no longer updated. Home of the humorous "Signs you've been playing too much Neo Geo." The informal, colorful, and rather anarchic group of gamers and collectors world-wide who share an interest in SNK's Neo Geo and its progeny. They are known for their passion and individualism. Neo Geo means "New World"
Produced in 1993, the Neo Geo CD system was SNK's attempt to bring down the astronomical cost of home games in order to broaden its market. The original Neo Geo CD is available in a limited edition front-loader and then a much more common top-loader. A second, faster system (the CDZ) was released in its final years. For several years games were released on both AES and CD. The CD system's fatal flaw was its long load times. SNK attempted to increase its popularity by releasing many "CD Only" releases (like the extremely popular "Bust-a-Move" and others like "Crossed Swords 2" and "Ironclad" -many of these exclusive titles are rare). The system had limited success and was scrapped by the late 90s. Special MVS unit designed to be connected to a TV. Very sturdy construction allows a TV to be placed on top of the stand-like unit. Contains an MVS unit that used home system controllers (can fit one old-style joystick inside cabinet). Uses a coin-slot. Was most likely designed for a hotel room. Neo Geo Hyper 64 was a failed attempt by SNK to create a 64-bit arcade system to follow the immense success of the Neo Geo MVS. It also used a similar interchangeable-cart system. Few games were made. Arcade PCB created by SNK that used easy to swap cheaper game cartridges (See MVS carts) instead of replacing the entire board. Came in several sizes (See 1-6 Slots). Format proved to be exceptionally popular, keeping the system alive from its inception (1989) until the present. SNK themed mini-theme parks in Japan. Had more than one location, main location in Tokyo Bay (complete with Ferris Wheel). Closed with the demise of SNK in 2001. NeoStore.com. Independent game store dedicated to the Neo Geo. Large Neo Geo website with forums, reviews, and international membership. Home of the Neo Geo Master List. Neo-Geo.com opened forums in August 2000 and rose to become a center of the Neo Geo community by late 2000. Official distributor of new English Neo Geo Home Cartridges (AES) since the release of Metal Slug 3. Neo Geo CD # are serial numbers written on the Neo Geo CDs. Before adapting country code numbers like NGH games (NGH#), English printed Neo Geo CD games had an "E" after the number. NeoGeoFreak/NGF-USA (commonly known as NGF): A very controversial company that took its name from the Japanese fan magazine. Formed by Dion Dakis and Chris Ray, two very big Neo Geo collectors. Their business tactics and honesty have been challenged on more than several occasions, including their release of KOF2k US. NGF and its founders Dion and Chris are currently being sued by Playmore (the legal owner of SNK's intellectual property rights) for multiple reasons. Here is the original press release from January 2003. NGF products are considered counterfeit and frowned upon in the Neo Geo Community. Avoid, avoid, avoid! Neo Geo Home. NGH is used alternatively with AES in describing home cartridge games. See AES. Neo Geo Home #: Numbers designating the order of when a Neo Geo game was produced. They are used on home carts (AES). All official Neo Geo games until recently included an NGH number. By 1997, the three digit NGH# was followed by a fourth number representing the country code. The NGH numbers do not always go in exact sequential order, leaving gaps accounting for games never completed/produced. Neo Geo Pocket (released Oct.’98). The original, Black & White Neo Geo Pocket that was only released in Japan. SNK release the NGPColor a year later. Neo Geo Pocket Color, the second and most popular portable system by SNK. Debuted in 1999. It could link with the Sega Dreamcast. Near-Mint. Somewhat relative term used to describe the condition of an item. As a general rule, something called Near Mint should be only have a few cosmetic problems. This is very important to collectors. See Condition Scale. Developer of Neo Geo games. Based in Japan. First game was Sengoku 3 for the original SNK Corp (SNK's last official title). Now a part of Playmore Corp. See Playmore. New Old Stock. Original items that were never sold. May or may not have been opened. Orochinagi.com: fansite devoted to the KOF series on Neo Geo. Merged with Neo-Geo.com briefly and unsuccessfully in early 2001 after its original server shut down. Printed Circuit Board. In terms of arcade games, a PCB refers to the arcade board: the part that contains that game in an arcade machine (it looks like large circuit board). The Neo Geo MVS is a PCB. An MVS-to-AES converter that allows home system owners to play cheaper MVS carts. There is a debate on its reliability, here is one view. Playmore Corporation. Official successor to SNK. Originated in S. Korea, now located in Japan. Owns all intellectual property rights held by the former company and develops and distributes games for its Neo Geo systems as well as for other popular systems. It owns Sun Amusement Corp. (Japan); Noise Factory (Developer); SNK NeoGeo USA Corp. (USA); SNK NeoGeo H.K. Co., Ltd. (Hong Kong); SNK NeoGeo Korea Co. Ltd. (S. Korea). Founded in 2001, the company changed its name to SNK-Playmore after winning a lawsuit in Japan for the "SNK" title (Aruze attempted to hold onto the SNK name within the Japanese market). By starting under the new name "Playmore", the company was able to move back into the Japanese market without immediately getting into a legal battle with the much larger company, Aruze. Private Message; can be sent in the forums. A game that originated from another system. If a game originated on one video game system (i.e. Neo Geo), subsequent versions created for other systems (i.e. SNES, Dreamcast) are considered ports. The Pro Controller was the second joystick released by SNK. It is not as big as the original controller, and is shaped like a kidney bean. Some players consider the design unwieldy. Special connection that delivers video in three separate feeds (Red, Green, Blue) for superior visual quality. Also known as Component Video. You must have a special scart compatible monitor/television. SNK produced an official RGB cable. An original MVS cartridge will contain ROM chips. ROM stands for Read-Only Memory. One of two basic types of memory. ROM contains only permanent information put there by the manufacturer; information in ROM cannot be altered, nor can the memory be dynamically allocated by the computer or its operator. The ROM chips in an original MVS game will be stamped by the game developer. The nickname for a video game file on computer. ROMs are played on emulators. Unless it is a homebrew, it is illegal to possess a ROM under any circumstances (See Nintendo's excellent FAQ on the subject here). The usage of the term has little to do with the actual definition. See Emulator, homebrew, and ROM (1). Modification for the Neo Geo home system that adds the ability to use S-Video for S-Video compatible Televisions. Superior quality. Sacrificial cartridge. Key component for conversion. See Conversion. Special tag created by SNK USA in 1991. See Dog-Tag. The first MVS-specific cartridges cases created. It's website includes fan created inserts. See MVS-Case. When SNK released the Neo Geo Silver System it included the Neo Geo AES system, one old-style controller, no game, no memory card. It was not widely released in the United States. SNK started producing these sturdier cases in 1995. Made of hard plastic, these clam-shell cases closed and were ‘locked-shut’ by a special flap. Other than the clear plastic-insert cover, the case was a one-piece mold and fit both the cartridge and manual inside. The interior bears the marking “SNK” which can damage a manual if incorrectly placed (rare, but confirmed occurrence). Very slightly bigger than the already large old-style cases. A Neo Geo item that was completely created by SNK, either through in-house manufacture or official licensing agreement. SNK NeoGeo H.K. Co., Ltd. Handles Playmore affairs in Hong Kong. See Playmore. SNK NeoGeo Korea Co., Ltd. Handles Playmore affairs in South Korea. See Playmore. Official Division of Playmore Corp. for North America based in Orange, CA. Handles MVS distribution and promotion in North America. See Playmore. Website founded by devoted SNK/Capcom fan Trieu. Includes a forum. The common abbreviation of SNK-Playmore, the successor company to the original SNK. It was founded by executive from the former SNK after their former company bankrupted under the ownership of Aruze. Originally called "Playmore", the company was able to add "SNK" upon winning a Japanese court case to wrest the name from Aruze. English Neo Geo carts that have the Neo Geo logo have stripes that go above the logo on the spine and to the right of the logo on the front cover. There was an idea by SNK to make the color of the stripe representative of the game’s genre: Red for fighting games, blue for shooters, and green for sports titles; but SNK never kept this uniform, and on many release simply reverted to the red stripes. Thus, nearly all official SNK produced carts were made with red stripes. There have been attempts to “correct” inserts to match SNK’s attempts by independent collectors and producers, but these are not authentic SNK creations. There was never an official orange stripe. A fully modded Neo Geo Home System. See Modding. An special home-system (Super Gun) by MAS Systems designed to play arcade boards on TVs. Can be cumbersome. See Super Gun. Supersellers of Japan was a very popular Neo Geo seller out of Japan that offered great selection, great prices, and notoriously odd communication. Sadly, it is no longer in operation. SNK vs. Capcom. This was the version made by SNK. The Capcom version of this match-up begins with Capcom (vs. SNK). A Korean made Home Cart system. Officially licensed by SNK. Has “VIC” written on the console. Much lighter than the standard console. These stickers were designed to prevent a person from tampering with a game and then returning it (originally designed for rental outlets and resellers like Game Dude). They are placed on the cartridge seams so that they leave very, very difficult to remove “void” stickers on the cart if removed, voiding any warranty agreement. These have been known to be a hassle to collectors and gamers alike. They can be removed off of plastic with proper cleaners (like Goo Gone). They cannot be removed from paper without severe damage. Used by Game Dude (on cartridges and CD cases only) and NGF (on carts, inserts, and manuals). Originally created as a Yahoo Club for sorting out disputes and flame wars, a version of the War Room was also created on the Neo-Geo.com forums. This forum has developed into its own, umm, unique community (for better or for worse) that's only loosely related to the Neo Geo. World Heroes (also: WH2, WHJ [Jet], WHP [Perfect]). User selected pictures used on forums. Members can select pictures from an existing gallery, or submit a small picture (64x64 pixels, .gif or .jpeg format) to the admin for uploading. "By The Way" –common internet shorthand. When someone posts in a thread just to put it back at the top of the forum. Not to be confused with Spam. “For Sale” –common internet shorthand. “For Trade” –common internet shorthand. “In My Opinion” –common internet shorthand. “In My Honest/Humble Opinion” –common internet shorthand. “Laugh Out Loud” –common internet shorthand. To visit and read a BBS or forum without registering or posting. Internet term for someone new to a hobby. Also known as noob or n00b. “Off Topic” –common internet shorthand. A post that adds nothing to a conversation other than to fill space. Spam posts and spamming (the action of creating spam posts) are frowned upon in internet BBS and forums. The name comes from the infamous meat-based product made famous by such comedy groups as Monty Python. “What The F—k” –common internet shorthand.